Ekaterina Kudashkina: This week we will continue to follow Libya—NATO has decided to assume the control over the military operation, but its ultimate goals are still debated; then we then take a broader look at the rest of the Arab world, which faces more turbulence; and finally we discuss Israeli Prime Minister Benjamin Netanyahu, who is got involved in another corruption scandal. Obviously I have read a lot about Libya these days, and my impression is that what is at stake today is not only the change of leadership in Libya, the loss of lives of civilians and perhaps control of Libyan oil. It seems to me that the stakes are higher and may not be directly related to Libya. Sergei Strokan: Let me put it this way: By taking control of the mission, NATO got itself involved in a very risky adventure. 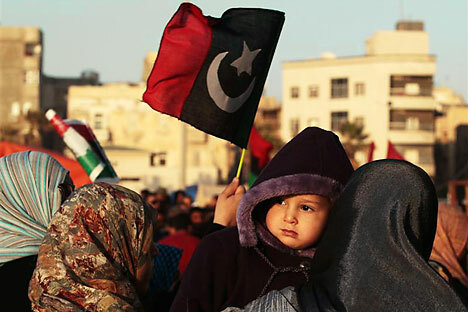 For NATO, which is in the middle of a severe “identity crisis,” Libya could turn out to be either the last nail in the coffin or a wonder drug to bring the aging alliance back to life. Symbolically, the military operation in Libya comes less than five months after NATO’s “historic” Lisbon summit, which spelled out its new security doctrine aimed at formulating the new cornerstone of its post-cold war NATO existence. As a result, the Libyan operation is the first serious test for NATO after its new military doctrine was rubber-stamped in Lisbon. There is a combination of quite pragmatic issues that shape NATO’s agenda as I see it in Libya. First, Libya is a very real challenge to the security of NATO member-states. Just imagine: hundreds of thousands of potential refugees from the region seeking shelter in Europe, then threat of humanitarian catastrophe, disruption of oil and gas supplies, etc. There are many factors. But we also have to keep in mind that for NATO, Libya is also providing a chance to test its transatlantic solidarity, to boost the “team spirit,” which has largely eroded, if not totally evaporated in recent years. The Libyan operation is also an attempt to show that NATO alliance is not a “one-man show”, dominated and controlled by American giant while Europeans are dependent passive onlookers. Ekaterina Kudashkina: This is all fine, but it doesn’t answer my ultimate question. It seems to me that the scenario of Libya being rejuvenating for NATO, as Sergei suggests, is a little far-fetched. First of all, there are no clear goals, at least known to the public; there is no clear strategy; and there is no clear exit strategy. But NATO would definitely score points in Libya only if its mission is brief, if it is restricted to air strikes and if it brings about the quick fall of Gaddafi regime. Mira Salganik: The other problem is how to avoid the massive loss of civilian life. Sergei Strokan: And finally, the most difficult thing for NATO would be to prove that the alliance really is not taking sides in the conflict, that it is not supporting the rebels. Ekaterina Kudashkina: Now let us hear from our experts. Our first guest speaker is Konstantin Eggert, an expert with the PR Center, which is a Russia-based center analyzing international affairs. Ekaterina Kudashkina: Mr. Eggert, the basic question is obviously about the information war around the situation in Libya, because the NATO operation has already become part of global information war, so to say. Public opinion is highly critical of NATO, but I am interested to know what you think about NATO, how NATO plays its information game? Konstantin Eggert: I think that there wasn’t much time to prepare for this “information war.” It is quite clear that nobody expected that the alliance would have to take action on Libya. I think that under given circumstances, NATO is playing its part very well. Speaking of public opinion, I think we have to distinguish the different kinds of public opinion. The United States is in a different situation, for obvious reasons, because the Americans are bearing the burden of the operation in Afghanistan, but the picture is not exactly black or white in terms of support or lack of support. I think that especially in Europe there is still very strong support for the operation; it could essentially evaporate but Muammar Gaddafi is not exactly a very attractive figure on the global scene. Ekaterina Kudashkina: Our second guest speaker is Alexander Rytov, a professor at the Moscow-based Institute of International Relations. Alexander Rytov: I think that the situation in Libya is not a usual test of unity and solidarity inside NATO. As you remember, the first stage of the operation was the involvement of separate countries, not under the command and control of NATO. France, Italy, Canada, the UK and the U.S. were first to interfere. But definitely not all NATO member states supported this openly; some of them noted and declared their non-participation, like Germany and Poland. That’s why I think the idea of consolidating NATO countries and showing solidarity and mutual understanding, at least on the surface, played a major role in passing the command of the operation to NATO. The success of this war will bring NATO together and prove the necessity of its existence, but if the situation in Libya fails to reach a quick results, it will show weaknesses in the alliance. Also, if NATO, its allies and the opposition in Libya fail to offer higher or the same live standards to the Libyan people as compared to those they had under Gaddafi, it can entail new problems and tensions not only in Libya, but in other countries of the Maghreb. I would like to once again voice my position that only very interesting and important proposals and offers from NATO countries and the world community to the Libyan people can really calm down the situation. If it looks like a fight for oil and natural resources of Libya, It will definitely lead to new tensions. And of course it will be very important for Russia to stay away from the war and try to keep its economic interests and presence in that country at the same level. Ekaterina Kudashkina: Now we will turn to Red Line’s second heading Between the Lines, where we discuss what we think is the most notable publication of the week. This time we have selected a Washington Post story “The Middle East crisis has just begun” by Robert D. Kaplan, who is a senior fellow at the Center for a New American Security. The basic idea of the story is that “despite the military drama unfolding in Libya, the Middle East is only beginning to unravel.” What is really interesting to me is Kaplan’s effort to analyze the trend and to find out where it will finally bring the Middle East and the whole world. It must be said that Kaplan is interested in what America stands to gain or lose from the “democratic revolts” in the Middle East. For our part, we in Moscow would like to know how the regional upheaval could affect Russia’s interests. Mira Salganik: This isn’t a novel prediction. Let alone in the interests only of the United States. I am sure the international community would be happy if democracy triumphs in the Middle East, except that this is wishful thinking. Sergei Strokan: And weak, quasi-democratic governments, which are likely to emerge at least in some Arab countries, may open doors for blatantly undemocratic regimes. Liberal regimes may come to power by democratic election but as we all know, election is not the only way for, say, Islamic fundamentalism to come to power. Actually, there is only one thing that can be predicted with certainty: the Middle East has entered an era of weakening central authority. It will inevitably lead to the formation of a new political and economic reality both in the Middle East and beyond, whether we like it or not. Sergei Strokan: I think the prognostication is mercilessly convincing. He admits that it is not democracy that actually matters for the U.S., but its national interests. Does this mean that Russia should also follow its interests? Russia is hardly mentioned in the Washington Post story we are discussing, but we have to understand what the Russian interests are. Ekaterina Kudashkuna: Let’s turn to another guest speaker, Vladimir Sotnikov, a senior research fellow at the Institute of Oriental Studies of the Russian Academy of Sciences. Vladimir Sotnikov: It is not yet very clear where the situation in Libya might be leading. From the point of view of Washington politicians and Washington-based analysts, Washington is actually fighting now between the desire to have Saudi Arabia as its closest ally in the Middle East and to fight off Iran. But from the point of view of Russian national interests, Russia should continue to follow the line of maintaining good relations with all Arab states, whatever the upheaval, whatever revolutions might take place. And I think the recent position of the Russian Federation in the UN Security Council shows that Russia is still maintaining its policy of strengthening friendly, good-neighbor relations with Arab states. So I think the points of view of the American side and the Russian side are very divergent here. Ekaterina Kudashkina: Now the time has come to turn to Red Line’s concluding heading Man in the News. This week the man is going to be Benjamin Netanyahu, the Prime Minister of Israel who is approaching the halfway mark of his second term of office in the midst of a big corruption scandal. The story goes back to 2008 when Netanyahu was a Knesset member and finance minister and claims that he and his family took extravagant trips paid for by American and European businessmen. It was made public last week by a TV program. An investigation was launched by the State Controller, who was assigned to look into the legal and ethical aspects of the prime minister’s behavior. The conflict entered a new stage this week after Mr. Netanyahu filed suit against the television channel and newspaper for making the allegations. It has been reported that Netanyahu is seeking one million shekels each from Channel 10 and the Maariv daily, saying that many of the facts reported were false and aimed to "ridicule" and "humiliate" him. Sergei Strokan: I understand his anger and his determination to sue the media. However, I personally don’t think that this is an appropriate way to build a working relationship with the press. Ekaterina Kudashkina: But in this situation in particular, we don’t know if Netanyahu is right or wrong, because the State Controller has not yet carried out his investigation. Mira Salganik: On the other hand, if proven true…Netanyahu's predecessor, Ehud Olmert, had to resign on corruption charges. He is currently on trial. Sergei Strokan: What bothers me is the problem of how to draw a line of between freedom of expression and information free-for-all. Today we are speaking about Netanyahu and obviously we have to think how this corruption scandal will develop, but all Israel-watchers agree that the priorities of the people there are security and the economic situation, both of which are relatively good at the moment. Moreover, Netanyahu was successful in navigating the economy through the global recession. Since Netanyahu came to power in 2009, Israel has not been engaged in any major military confrontations with its neighbors though provocations are taking place almost every day. This also goes to his credit, while the situation is still explosive. Ekaterina Kudashkina: Scandals like this one are never timely; however, this one seems to come at a particularly sensitive moment. No doubt that Israel is facing a time of heightened anxiety over the new and fast changing situation in the Middle East. The whole situation seems to be so complicated that we need to turn to our next guest speaker, Yevgeny Satanovsky, President of the Moscow-based Institute of the Middle East. Yevgeny Satanovsky: There is no chance that in the case of Netanyahu the mass media will have any possibility to do something with him. This is not corruption in style of [Silvio] Berlusconi or [Nicolas] Sarkozy. Netanyahu has a stable situation and I think he has a guarantee that for the next year or 18 months, nobody can replace him. First of all there are no relations between Israelis and Palestinians, there is no chance the Palestinian leadership will really decide to build the Palestinian state. Then, all these revolutions around Israel – problems in Syria, in Jordan, revolution in Egypt, troubles in Yemen, give him certainty that the last conflict in the Middle East that could be interesting to anybody is the conflict between him and Palestinians.